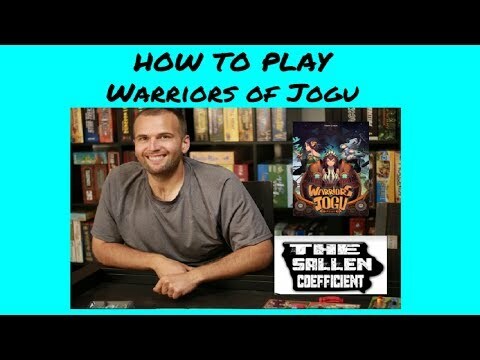 Warriors of Jogu is a two-player card game in which players take turns playing units into one of five locations. The five locations are numbered 2 to 6, and at the end of each round battle happens at only one or two of these locations. 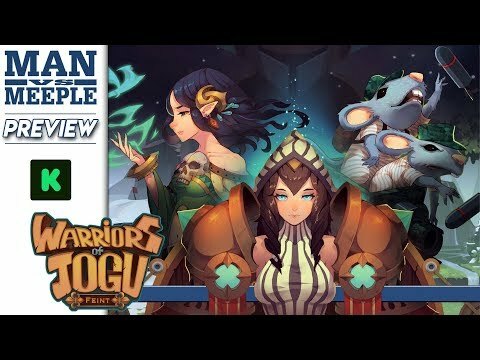 Each unit that is in a battle location contributes its strength multiplied by the value of the location, and the sum of the contributions from all of a player's units is their strategy rating for the round. However, each player only knows one of the two battle locations, while their opponent knows the other battle location! The player with the higher strategy rating wins the round and one victory point. The other player not only loses the round, but also loses an amount of morale indicated on the units they deployed to the board — so be careful about playing too many units as they will cost you morale if you lose the round! If a player runs out of morale, the game ends immediately and the other player wins. If at the end of seven rounds, no player has ran out of morale, the player with the most victory points wins. In case of a tie (made possible by some special abilities), the player who won the final victory point (in the final round) wins.